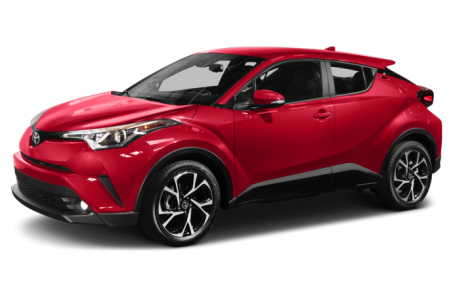 The 2018 Toyota C-HR is an all-new subcompact SUV, which is now Toyota’s smallest SUV in the lineup. It competes with the Mazda CX-3, Honda HR-V, and Nissan Juke. Two trims are available: the XLE and XLE Premium. Like its competitors, the C-HR has unconventional, bold styling. It has a rather elaborate sculpt with multiple creases, channeling, and bending lines throughout its body. The front-end features sharp-angled headlights and overlapping folds at the grille and lower fascia. At the rear, fin-style spoilers protrude at the roofline and tailgate, while arrowhead-shaped taillights are molded around the rear fenders. Standard features include LED daytime running lights and sporty 18-inch alloy wheels. Front fog lights and power side mirrors with turn-signal indicators are also available. The C-HR is powered by a standard 144-hp, 2.0-liter 4-cylinder engine mated to a continuously variable transmission (CVT) and front-wheel drive. Fuel economy for the C-HR is an EPA-estimated 27/31 mpg city/highway. Inside, the five-passenger C-HR has a standard cloth interior with sporty front bucket seats and a 60/40-split folding rear seat. Maximum cargo capacity is 36.4 cubic feet with the rear seat folded down. The center stack features a standard 7-inch multimedia touchscreen with Bluetooth connectivity for phone and audio, voice recognition, and a USB port. Standard features include dual-zone automatic climate control, a leather-trim steering wheel, and remote keyless entry. Push-button start is optional. Standard safety features include ten airbags and a backup camera. The C-HR also has standard Toyota Safety Sense P, which includes adaptive cruise control, lane departure warning, pre-collision system, and pedestrian detection. Blindspot monitoring is also available. 38 of 41 (92%) consumers said they would recommend this vehicle to a friend.